This evening Kenny, Shane and Adalyn were outside in the front yard. Shane hopped on his "monster truck" aka his tricycle and started riding around the cul-de-sac. Adalyn instantly headed into the garage and drug out our little yellow sign that says "caution kids at play" on it. She took it all the way down the drive way and set it right on top of the man hole cover (where Kenny always puts it). She then turned around and headed back to the yard to play. As she was doing this Shane stopped riding and watched her. After she was done Shane turned to Kenny and said "She is really smart!". Kenny came inside and told me this and I just had to share. A little tiny moment of today, but one of my favorites. **I love having just one kid. One kid is perfect in so many ways. **I can give that child just about all the attention they need or want. I can fill their cup up completely and it doesn't exhaust me in the process of filling them up, taking care of my needs and all the other tasks I must accomplish in a day. **I enjoy spending time with each one of them one-on-one. I was reminded how much I like each of them on their own. They are so much fun to hang out with and play with. **I can get so many things in my life accomplished with only one kiddo in the house. When that one child is happy and content I can slip away and work on housework, job work, etc. Then when the end of the day arrives I'm scurrying trying to catch up on all the things that need to be completed by the end of the day, like I do when I have two kiddos around. **Popping one kiddo in the car and running off to do fun things or errands goes so much more smoothly then when there are two. **Watching them play and interact together in one of the best things ever! **Having all 4 of us together feels complete. **I'm exhausted at the end of the day when there are two. I often have no more energy to finish the long list of things that needs to get completed after they are sleeping. **I hate being a referee! The little squabbles that happen on and off all day long drive me crazy. **There almost always seems to be one kiddo that needs help with something when you have two. As soon as you settle into a task or have finished helping one child, the other one needs his bottom wiped, has fallen, needs a snack/water, etc, etc, etc. There is no rest for the tired when you have two. Well...two kids it is. That was what we picked, no going back on it. I don't have any regrets if you are wondering. Having a boy and a girl was what I always imagine and pictured I would have. I like that complete feeling, even though there are days I'm tired beyond belief or times I'd love to just have one. Instead I'll relish in the moments that I do get one-on-one with each of them and rejoice in the moments they are happy and getting along. I've been dying to start toddler group with Adalyn. Our schedules didn't allow us to go last year, which I was so sad about. Finally the day arrived for her first day! She woke up 100% toddler this morning. Using that favorite new word "no". She would not stand by the door where I asked her to. This was where she wanted to stand. She would not look at me and when she did she "smiled" for the camera. We dropped Shane off at preschool and then headed to toddler group. Adalyn totally knows what that is and was super excited to go this morning. She was ready to play the minute we walked in. From my end of things it was very, very odd to have a kid not cling to me, let me talk to another adult and be okay when I walk away to get them snack (which was what Shane was like at toddler group....this is where the Sensory Processing Disorder comes into play for him). I very much look forward to our year at Lake Washington Toddler Group with Teacher Susy and all our new friends. Lately my Close To My Heart life has been getting ignored. Between having fun this summer and prepping for my new school year at Redmond Toddler Group, I just haven't gotten to any of my CTMH work. I am excited to announce I will be continuing my monthly workshops for the rest of this year. The new autumn/winter Idea Book came out and there were just so many awesome projects I couldn't say no to hosting my workshops. Since really the only craft projects that get completed around here are my workshop projects. This is just a gorgeous piece of artwork. I can't wait to finish mine and get it hung up in our house. The workshop one will look similar to this example. Cost: $30 + you'll need to provide 5+ pictures of your own. There are a couple spots available, but the RSVP deadline is just around the corner! There were just so many fun Halloween things I wanted to make that we are going to be doing them all! We'll be making an EEK banner, a 3D pumpkin, a coffin and a card or two. Get your house ready for Halloween. The holidays really are just around the corner and I can't wait to get my Christmas cards made and ready to give to my family and friends. 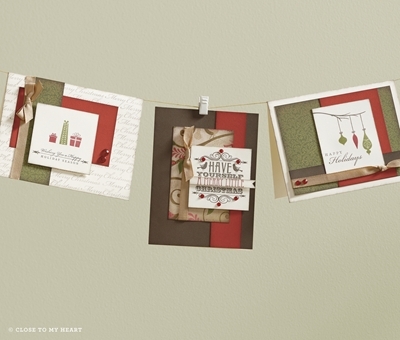 We'll be making 9 cards (3 of each design) using the new Pear and Partridge paper packet. If you'd like to make more sets, not a problem, just let me know. 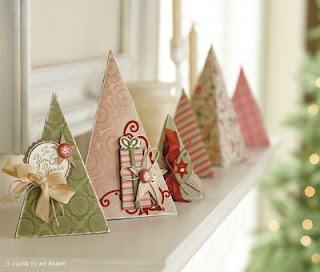 We'll be making 6 adorable paper Christmas trees. You can use them to decorate your house for the holidays or gift them to a friend. If you are interested in more details about my workshops or would like to RSVP for a workshop, email me at jessicadbooth @ hotmail (dot) com. Me: Shane and Adalyn, I'm going to be folding clothes in my bedroom if you need me. Me: You are going to help me fold the clothes? Adalyn: frantically pointing at the top of the dresser...Uhuh, uhuh, uhuh!!! Me: (extremely confused) There isn't anything up there for you to have. I handed her a penny. She took off with it straight to her bedroom and put it in her piggy bank. Man, that girl picks up on things fast! She just cracks me up. Shane was out playing in the cul-de-sac with a Lily (our neighbors granddaughter). She was practicing riding her bike with out any training wheels. After Lily left Shane asked if we could take his training wheels of his bike. We weren't going to do that until next summer, but since he was asking we did. In the process of taking them off the chain wouldn't stay on so he didn't get a chance to try it out that day. The next day I got it fixed. Finally, Friday Kenny to him out to the cul-de-sac to let him try his bike out. Kenny help hold him up and ran along side him for a brief moment and then he was off. No questions asked, no falling, no problem at all. He rocked it! Kenny needed help get him started but then he was good to go. This weekend Kenny to him out again and he didn't even need any help getting started. We are both so amazed by how fast he has picked up riding with out training wheels. The other most amazing part of it was how nonchalant he was about the whole thing. If you know Shane, you know nothing is easy going with him. All activities and all tasks come with a million plus questions and most often a lot of nerves, fear and anxiousness. Except it seems riding your bike. Then there are no questions asked. Shane headed off to his first day of preschool today. He had orientation on Wednesday, but I was there, so that doesn't really count as a day of school. This is his 3rd/final year of preschool. He goes to a "5's" class with 12 other kiddos that just aren't quite ready to make that transition into kindergarten. His teachers are Mrs. Armfield and Mrs. Stevens and we love both of them. There wasn't a lot of whining or "I don't want to go to school" talk as he got ready this morning. He had a whole bunch of questions for me in the car on the way to school, which is VERY normal for Shane. We pulled up, Mrs. Armfield took him out of the car and off he went WITH OUT a tear! Yes, you read that right. His first day back at school and he didn't shed a tear! Huge, I am telling you, just huge for this kid. Here he is at the end of his first day. Happy as a clam. He even got a sticker for being brave at school and not crying. We are seeing improvements with this kiddo, they may be baby steps, but steps none-the-less. Here is to a year of preschool with no tears!! Over the past month or so my clothes seem to be getting tighter and tighter when I put them on. At first I just thought I was having an off day, but then it turned into an off week, now it's been an off month. I really would like to blame this on my dryer. I mean that darn thing could just be shrinking every piece of clothing I own. I haven't changed my daily routine at all. I have been eating the same, sleeping the same, exercising the same. Blaming the dryer really seems to make sense, but the dryers fault or not, those darn clothes just aren't fitting the same and I don't like the way that feels. That brings me back to the exercise portion of my life. I've always been an on and off exerciser. Some phases of my life I've done really well with going to the gym and exercising other times not so well. I'd say this off exercise phase has been a long one. Though I do chase two kids around daily, which helps a bit, but those muscles don't look like they use to and my stamina isn't as good either. Motivate is hard for me to come by since I feel like there just isn't time to fit anything else into my life. Yet, I am not happy with my sluggishness and clothing issue. Guess it is time to change things up. Competition seems to work best for me personally as a motivator. I'm pairing up with a friend and we are hoping a little friendly competition/challenge will get both of our butts in gear. The person who works out the most (more then a casual walk) gets a small "treat" (Starbucks, magazine, etc) from the other person at the end of the month. For the month of September I've set a goal of working out twice a week. I got my first workout in of the week yesterday! I'm going to beat that darn dryer at its game. A few months ago Kenny and I started talking about changing up the car situation in our household. I generally drive "Stormy" our Pathfinder and he always drives "Car No Name" his Civic. I won't drive his car because it is a stick shift and I just hate driving them. Which means on days or evenings that I need to travel a good distance I am always taking our big SUV. His stereo recently went out in his car and he wanted to fix that situation. It just seemed to make sense that we move onto to a car that I can drive as needed and that we can all fit into comfortable as well. We thought that would be just a casual "swap" of cars. Something used and basic. We weren't going to put out any money really into this car thing. Just sell his and use that money to buy some thing that fit the bill. Turns out that really wasn't going to be possible after researching used cars and prices. Then the research began on new cars, an area we hadn't paid much attention to in years. We narrowed the search down to 5 different types of cars and set out to see them in person. That 5 quickly got narrowed down to 2, the Nissan Versa and the Mazda 3. After more researching and some great incentives over Labor Day weekend from Nissan, we settled on the Versa. Four plus hours later, we drove away in "Vice" the Versa. We had a GREAT experience with Nissan of the Eastside. Melvin and Kimethe, our Sales Associates, were wonderful to work with. We had a number in mind and Melvin really did work to make sure both sides on the deal were happy. Our longest wait was to get into see the financing guy and if it wasn't for that hour long wait it really would have been a fairly quick and painless transaction. The wait was due to so many people buying cars that day, so we understood, but with two kids in tow an extra hour is a looonnngggg time. Shane thought buying a new car was super fun (most of the time, except all the waiting). He even said this morning, you didn't really pay them money for our car, you just gave him a piece of paper. We then needed to explain the concept of a check. Now we just need to sell Kenny's Honda Civic. Fingers crossed that is also an easy and smooth transaction! Fall is in the air, school starts this week for Shane and we have cinched up the drawstrings of our spending. What does spending have to do with September? Well, nothing really. Except that we've had a fun summer which included a few small trips here and there, a Family Fun Weekend, and lots of house improvement projects outside. Oh, and we just bought a new car. You'll meet Vice the Versa soon. We've named September the no spending month as well as the time to sell month. We have a few things laying around the house that I'll be posting on eBay, craig's list or taking to the consignment store. No more eating out and no more house improvements! We actually hope to take this theme into October and even November if we can. Sort of a gearing up for the holidays saving binge and for the master bathroom remodel that will start January 2013. We've only been on this "budget" now for 2 days and it has been kinda hard already. You forget how easy it is to grab the kids a little snack if you've been running around all day, or to rent a movie on a whim Saturday night for something to do. Habits can be broken and I've started by saying no to a couple upcoming gatherings in September. That may sound easy, but I'd LOVE to go hang out and see the new Thirty-One catalog, or browse the Usborne books with friends, or even discover a new house decorating company. But if I put myself in those situations, it is hard to not buy something because it is all awesome stuff. Instead I'll stay home and kept my purse straps closed and my credit cards in my wallet. Happy No Spending September to you.